Last week, my boss said he had cheated on me. Say what? Apparently said boss ate a Mint Chocolate Chip Cupcake from a local bakery and thought it was amazing. I shrugged my shoulders because I didn’t really know that an exclusivity clause came with consuming my cupcakes. Then came the words, We were wondering if you can make a better batch? Seriously, did he just propose a challenge? Game on. My game face lasted about 2 minutes because I realized that I had no more than 1/4 cup of cocoa powder in the house. I have no idea how this happened because I’m kind of a cocoa powder hoarder – it’s a bit of a problem. However, after a quick fridge scan, I realized that I did have all the ingredients for my favorite boxed mix recipe. Game back on. I figured if anything, I could play around with mint-chocolate buttercream to get the recipe just right and then test out a scratch recipe later. Since I wanted the mint flavor to really shine through in both the cupcakes and the frosting, I took advantage of the bag of Andes Crème de Menthe baking chips that I have been taking up space in my pantry for months. 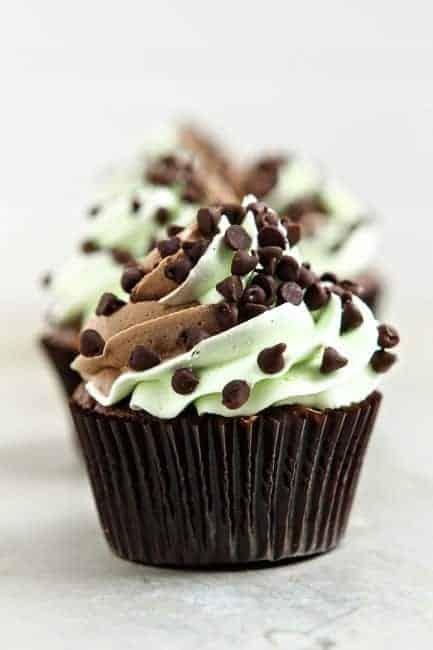 A quick swirl of two-tone, mint-chocolate frosting and a sprinkling of mini chocolate chips created Mint-Chocolate Chip cupcake perfection. All this mint chocolate cupcake perfection ended up completely for naught! A huge storm blew through that resulted in downed trees, power lines, no electricity, and work being closed for a day and a half. Sorry, Bossman! Better luck next time. Preheat oven to 350°F. Line muffin tin with paper liners or spray with non-stick cooking spray. In the bowl of a stand mixer or a large bowl with a hand mixer, add the cake and pudding mixes, sour cream, oil, eggs, vanilla and water. Mix on medium speed for about 2 minutes until all ingredients are well combined and the batter is smooth. Stir in the Andes Crème de Menthe baking chips. Using a large scoop distribute the batter between 24 muffin wells; about 3 tablespoons of batter per well. Bake in preheated oven for 18-23 minutes or until the tops of the cakes spring back when lightly touched. Allow cupcakes to cool inside muffin tins for about 10 minutes. Remove cupcakes from muffin tins and allow to fully cool on a wire rack. Once cupcakes are cool, prepare your frosting. In the bowl of a stand mixer fitted with the paddle attachment, beat the butter on medium-high speed for about 5 minutes. Turn the mixture down to low speed and gradually add in the confectioners’ sugar until it is completely incorporated. Add in vanilla and heavy cream. Turn the mixer back up to medium-high speed and beat the mixture for about 3-4 minutes or until light and fluffy. Remove half of the frosting from the mixer bowl and set aside. Add a tiny amount of green gel dye to the remaining frosting (I used Wilton Leaf Green). Turn the mixer on and fully incorporate the dye. Slowly add more dye until you achieve a nice minty green color. Stir in peppermint extract. Remove the mint frosting from the mixing bowl and set aside. Add the other half of the frosting back into the bowl of your stand mixer. Add in the cooled, melted chocolate and cocoa powder. Mix until fully incorporated. For the two-toned effect, I used this method from GoodLife Eats. You can also carefully layer the two colors into the piping bag, but I find Katie’s method to be much easier and cleaner. Pipe the frosting onto the cooled cupcakes and garnish with mini chocolate chips. 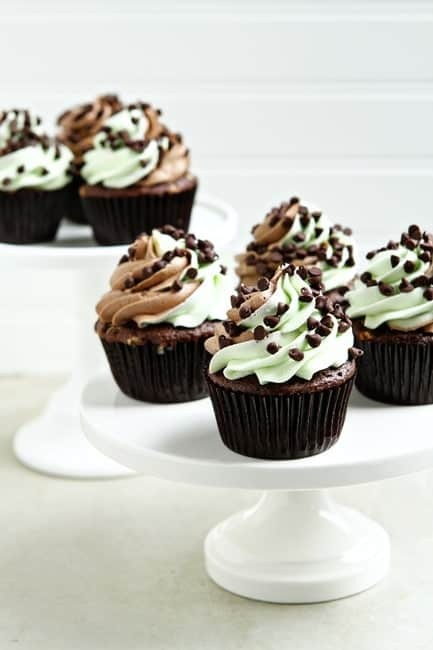 Mint Chocolate Cupcakes are best served the day they are made. However, they will keep in an airtight container within the refrigerator for up to 2 days. Remove to room temperature one hour before serving. If you want a mintier kick, gradually add more peppermint extract to the green frosting. Just use a light hand, peppermint extract can be pretty potent. Dark brown liners were purchased from TomKat Studio. A large star tip was used to pipe the frosting. DISCLOSURE: My Baking Addiction is an Amazon.com affiliate and will receive a small commission on the linked cookie scoop if purchased through the Amazon link within this post. 95% of the over 650 recipes on My Baking Addiction are from scratch. Being that this is a public blog, I try to appeal to a variety of readers at varying skill levels – many of which actually request doctored cake mix recipes. The beauty of the internet is that there is a wealth of information and recipes at your fingertips, so I am certain you will find a different recipe and blog that better meets your needs. Thanks so much for stopping by – have a great day. I must say that I am a professional chef and I think these cupcakes are gorgeous. I have many colleagues that make wedding cakes on a regular basis and use mixes. They use them because the leavening agents are always exact and they know that each batch is always going to be the same. There is nothing wrong with doctoring up a cake mix. I made these for my son’s birthday and they were amazing. What a great semi-homeade recipe. The flavor is out of this world. Thanks for making me look good. Made a couple of attempts at making these yesterday with so-so results. The few different devil’s food cake mixes I’ve found all say they have pudding mix added in, so why the extra added package of pudding mix as well? My first attempt was with the Betty Crocker mix and the batter came out perfectly but I put too much of it in each cup as I didn’t know they would grow so freakishly huge! They were mutants that I was unable to decorate so I figured I’d just start over. Bought a Pillsbury mix the second time and the batter came out extremely thick and fudge-like making it very difficult to spoon the batter in and with just an okay end result. Any tips? Has anyone else tried making these? What mix did you use? Jenny. for this recipe the batter is going to be very thick. but this is the best boxed cake mix ever. I can’t find one to beat these. These cupcakes are amazing! And just in case anyone was wondering, they are 16 Weight Watchers Points Plus per cupcake. Wonderful! Thank you so much for sharing. I just loooooooove to bake cupcakes! And my all time favorite icecream is Mint Chocolate Chip, so this is the best thing ever! My son (and my hubby’s) favorite thing is mint chocolate chip (especially when green coloring is involved somewhere). I would like to make these for my son’s class as his 4th birthday treat on Monday, however I’d like to make mini cupcakes instead. Can you recommend baking time for minis? And approx how many tablespoons per mini cupcake well? I’d really appreciate it. Hi Simi, I’m really sorry I didn’t get a chance to answer sooner. Mini cupcakes usually need to bake on the lower end of the time listed, so 18 minutes. I believe it’s roughly 1 tablespoon per well. Hi there, do you have a vanilla version of this chocolate mint cupcake recipe? You might like these Vanilla Bean Cupcakes https://www.mybakingaddiction.com/vanilla-bean-cupcakes-recipe/ Thanks for stopping by. I just want to say that these cupcakes taste wonderful but my only complaint is that this cake mix makes way more than 24 cupcakes. I really think that maybe you should adjust how many they really make because in trying to use all the cake batter for 24 cupcakes they turn out extra large and look really bad for frosting them. I was making these for a company and had to start all over due to the how large they were. they wouldnt even fit into the cupcake container that I bought. these make about 30 cupcakes. all in all taste of them are fantanstic. Cupcake pans can vary in size and that is probably why the yield was different for you. I’m glad you liked the taste. I made these for a bake off at work and “I WON!” My son just turned 6 and he put in a request for me to make these for his party! Everyone loved them, thank you for the free recipe! I’m glad the recipe worked for you. Thanks for stopping by. I used 1 1/2 cups of the Andes baking chips. I hope this helps. Sorry…I know the recipe said 1 1/2 cups, just wondered if that ended up being the whole bag or not. The whole package is 2 cups, so not quite the whole package. I hope this helps. Thanks! I over-added then, but my husband’s coworkers raved over them (and the frosting), so it seems no one minded a bit! I bet they were delicious! Wow, delicious, fudgey chocolate filled cupcakes. I use the whole bag of Andes mint since i wasn’t planning to use any frosting and they still came out perfect. They were bigger than I expected but what’s wrong with more cake! I’m so glad the recipe worked for you. Thanks for stopping by. if you wanted to do a peppermint version of this would you use the andes peppermint baking chips or just omit them from the recipe? I love the peppermint Andes – I think they would work just fine! Thanks for stopping by! I don’t often leave comments (ironic coming from another blogger), but I just had to leave one this time. You’re a genius! Seriously. You’ve doctored a basic box devil’s food cake so perfectly. I made these last night to bring into work for a NYE potluck (along with your Nutella buttercream frosting for a different cake mix I doctored), and these flew off my cupcake stand. Even using generic pudding mix and sour cream, the cupcakes were moist and delicious. The frosting is amazing (although I didn’t make quite enough chocolate to get my swirl as even as I wanted). I was able to bring in a pretty fancy looking treat without having to stay up until the wee hours of morning to get it done. Thank you! I’m so glad the recipe was such a success for you. Thanks for stopping by. In response to the comment about using box cake for this recipe or any others. Every good baker has a recipe with at least one of these used. The trick is to tweak the recipe to make it your own…that is what talented bakers do! This is not cheating, it is thinking “outside the box”! Being the passionate baker I am …. I love all your recipes! Do you have to refrigerate these? I’ve always made my cupcakes the day before and have never refrigerated them. or maybe they are better cold? Hi, Danielle! Refrigerating them will keep them fresher longer. Bring them to room temperature before eating. Let me know if I can answer any other questions! Could you use this as a cake recipe as well? I’m thinking of making for my daughters bday and she wants a cake. Hi, Ashley! You could absolutely use this as a regular cake. Just follow the directions on the box for the kind of cake you want. I hope you enjoy it! Hi, Sam! Andes Mints baking chips and After Eights are a little different. You could probably substitute any type of chocolate mint candy for the chips. After Eights have a creamy mint center that I don’t believe would work in the cupcakes. Let me know what you can find! I’m always here to answer more questions if you have them. I just finished making these and they taste amazing! Everyone in my family is a peppermint lover so this is the best cupcake for us! I’m so glad to hear that, Itzel! These were amazing! I used them for a school cupcake wars type fundraiser, and we won 1st place. I used buttercream frosting instead of the mint frosting. I didn’t want to overwhelm with too much mint. Such a great recipe. Congratulations, Valerie! I’m so glad everyone enjoyed them. You’ll end up with about 24 cupcakes. Have a great day and happy baking! Who is “Katie” that you mention on your recipe. Is there something else you can use besides sour cream or crssm cheese. I don’t care for eather item. They sound like they will taste great. Thanks for your help. Katie is a fellow blogger at Good Life Eats. You can use Greek yogurt instead of sour cream if you prefer. Thanks so much for stopping by. Just realized I got a cake mix that is 15.25 oz. Any advice on how to doctor the recipe so I can use this box cake mix size instead? Thanks in advance. Can’t wait to try these! Hello! You can see how to doctor up a 15.25 ounce cake mix here: https://www.mybakingaddiction.com/cake-mix-recipe/. Hope this helps! Happy baking.